Planning a trip to Phoenix can be tricky. You can get some great rates at fantastic resorts in the summer, and there are certainly advantages to visiting the Valley of the Sun during the summer months. But before you make your reservation, make sure you understand Phoenix weather. Phoenix experiences about five months of summer and the weather in Phoenix can be brutal if you aren't used to it. You will see average temperatures for the Phoenix area published in various places, and they will vary by a degree or two. Keep in mind that the official temperature for Phoenix is monitored at Phoenix Sky Harbor International Airport in downtown Phoenix. Slightly cooler temperatures may be experienced in the suburbs of Phoenix, especially those cities at higher elevations, with differences being possibly as much as five degrees from the official Phoenix reading. Read on for more information about the unique weather in Phoenix, Ariz., including month-by-month temperatures and what to pack. Surprising to some visitors, Phoenix does experience a season of occasional very heavy rain, also called a monsoon season, each year. These powerful storms sometimes have winds in excess of 50 mph and often result in flash-flooding and dust storms. Spring starts in early March in Phoenix and is a great time to visit. Temperatures are warm and the days are gradually getting longer. For a desert, Phoenix is also incredibly colorful—you'll spot blooming citrus trees, fig trees, and ocotillo blooming with red flowers. The days start to get longer and it's a perfect time for hiking. What to Pack: You won't need a sweater or jacket in the spring, but a long-sleeve T-shirt or sweatshirt can come in handy if a rainy day is slightly cooler. The weather is warm enough for swimming and most outdoor activities. Summer in Phoenix is likely what you expect: Hot, sunny, and best spent indoors under the cover of air-conditioning. Temperatures, not surprisingly, hit the triple digits almost every day from June through September, except for the occasional fast-moving thunderstorm. Nighttime temperatures are a little cooler. What to Pack: Lightweight clothing is a must. Look for breathable fabrics that wick away moisture. Additionally, don't forget to pack sunglasses, a hat to protect your face from the sun, and a high-factor sunscreen. Fall in Phoenix is quite similar to spring, weather-wise. Temperatures are still warm, if not downright hot in September, but gradually cool down to more manageable numbers by the end of November. Arizona does not observe Daylight Savings Time, so while the days do get shorter, it does not seem artificial like in other locations. What to Pack: Pleasant daytime temperatures mean that shorts, T-shirts, and other light clothing is appropriate. However, you'll begin to feel the first chill in the evenings and should definitely pack a few sweaters or lightweight jackets. 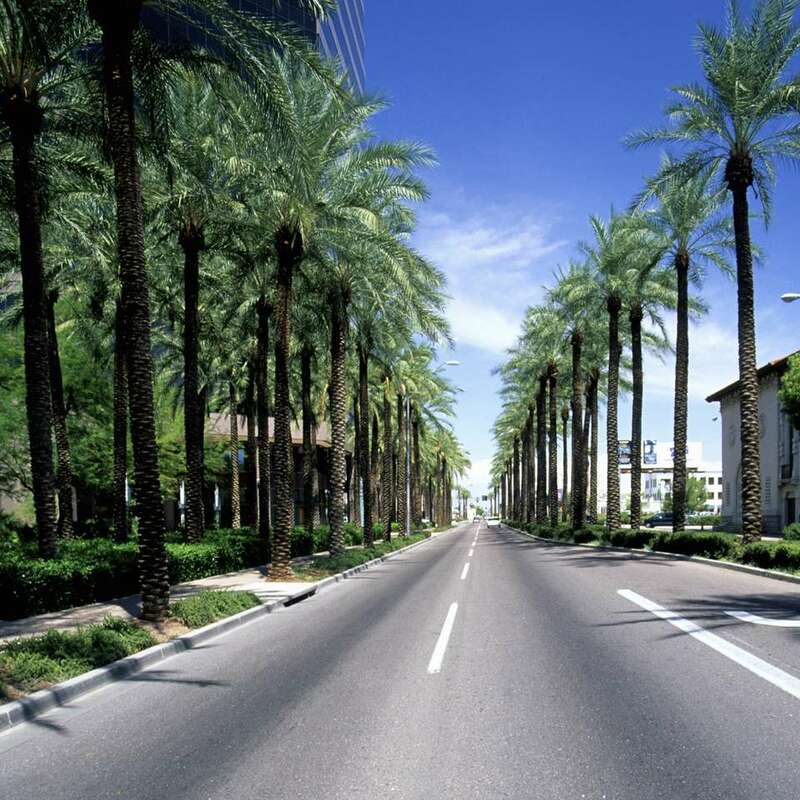 Phoenix is pleasant year-round and winter is no exception. Days are usually warm and sunny, but not stifling hot like during the summer months. While it might be too cold for flip-flops and long days by the pool, temperatures are still plenty warm for outdoor activities like hiking or golf. Nighttime temperatures get chilly, but true frost (and any form of wintry precipitation) is rare. What to Pack: Given the large temperature fluctuations during the winter months, layers are crucial to staying comfortable. Jeans and a T-shirt are comfortable and appropriate attire for most days, but you'll want to add on a sweater or hoodie for those chilly nights. A scarf, albeit not a super heavy one, can always come in useful as a cover-up during colder temperatures.